What is it? Energize Eastside is an 18-mile high-voltage transmission line (230,000 volts) running through four Eastside cities: Redmond, Bellevue, Newcastle, and Renton. These extra high-voltage power lines would run next to 9 schools and 9 churches and cut through 13 parks and 29 neighborhoods. The lines would run on metal poles 20-30 feet taller than the current wooden poles. The poles would protrude above the treetops and be visible for miles. Is it necessary? The Eastside’s population has been growing rapidly, but electricity use has fallen due to more efficient lighting, appliances, and smart devices. Like many utilities, PSE failed to foresee a reduction in electrical use. Instead, the company designed a solution for a forecast that never materialized. Is it safe? 230 kV power lines are not commonly installed near homes and schools. It’s even less common to install poles within feet of aging petroleum pipelines. PSE hired a safety expert to study the risk. The expert did not conclude that the project was safe. An accidental fire could be fatal to residents and could not be extinguished by the fire department. Is it reliable? At an electrical reliability seminar held by the City of Bellevue, PSE admitted that the project would not improve standard metrics for measuring reliability. Energize Eastside would not prevent power outages caused by storms, earthquakes, or malicious attacks. Who benefits? Energize Eastside might help maintain large flows of electricity to Canada and California under very rare circumstances. Consumers outside the Puget Sound region would benefit more than Eastside residents. PSE’s foreign investors would enjoy higher returns on their capital, funded by higher electric bills for us. Is there a better way? Eastside growth is better served through incremental investments in modern technology. PSE’s outsized and outdated proposal would have an enormous up-front cost of $200 million or more. PSE also gets nearly 10% interest on the project for decades. The total cost to customers would be over a billion dollars! Check out our Better Solutions page for more info. Steel monopoles will replace the wooden poles. 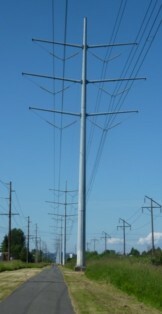 They will be 20-30 feet taller than existing poles and larger in diameter.